In the Wapiti area of Shoshone National Forest, you’ll find trails that make hiking a real pleasure, with gorgeous views and the natural environment filled with surprises around every bend. The Wapiti District of the Shoshone National Forest reveals some of nature’s most amazing wonders, from alpine meadows to waterfalls. Hiking the moderately difficult trails presents adventures to all those who venture here. You’ll find a number of great trails west of Cody and east of Yellowstone National Park. This hike goes across many small streams and through Camp Monaco, a 1913 hunting camp established by Buffalo Bill Cody. Visit the Sam Berry Meadow where you can enjoy the river with its fringe of pines and spruce trees. There are some incredible views, particularly of Hughes Creek and a lovely waterfall. It’s an 18-mile trek of moderate difficulty. Travel 50 miles west of Cody on US 14/16/20, and the signed trailhead is at the North Fork Shoshone River near Pahaska Tepee, with ample parking. This 14.7 moderate hike takes you through the exotic primeval forests and a wilderness valley, with a rare glimpse of old-growth woods. Start out at the footbridge over the North Fork of the Shoshone River, 50 miles west of Cody on US 14/16/20. Distance: 14.7 miles, but can continue on for a 20 mile total. This is a real hiking adventure with scenic views for 18 miles. Crossing the Elk Fork Creek a number of times, wildlife viewing is at its best on this excursion into the backcountry. If you continue up to Rampart Pass on this trail, be prepared for more of a backpacking trip than a hiking trip. Start out at Elk Fork Campground to get to the trailhead. To get to the campground, take US 14/16/20 50 miles west of Cody and 9.8 miles west of the North Fork Shoshone River Bridge. This 5-mile moderate trail takes you through an old burned forest outside the boundaries of the Washakie Wilderness. Following the creek, it climbs up to the summit of Clayton Mountain with some outstanding views. You’ll find an unimproved road 38 miles west of Cody on US 14/16/20, with parking at the end, 1.5 miles south of Blackwater Lodge. Just 45 miles west of Cody, inside the Washakie Wilderness you can climb into the alpine regions quickly, passing through lovely meadows and dense timber. Flora Lake lies near the trail’s end. This 6-mile hike moves through the wilderness backcountry, and finally turns into the Table Mountain Trail. Most of the hike will take you along the top of a ridge, from which you will get some breathtaking scenic views of the North and South Forks of the Shoshone River. From Cody, drive 22 miles west on US 14/16/20. This is off a private road leading to the Green Creek Summer Homes. Note: private landowners may or may not allow hikers access. Although rated a moderate hike, this trail is steep and moves through some rocky backcountry. Only the first four miles are maintained. It’s a real challenge but beautiful all the same. Drive on US 14/16/20 for 31.5 miles out of Cody. The trail is signed and is only ¾ miles up the indicated road. Crossing the Fishhawk Creek 8 times within two miles, this moderate hike takes you into the Washakie Wilderness and moves you along the top of a hill. There’s a steep grade at one point, but it’s still a moderate hike. Fishhawk Creek trail is 42 miles west of Cody on US 14/16/20. There is no sign but you’ll find a large parking area on the south side of the highway. Following the Crow Creek, the trail then veers off slightly northward and climbs to Crow Creek Pass. Get some incredible views of Cody and Silvertip Peaks. 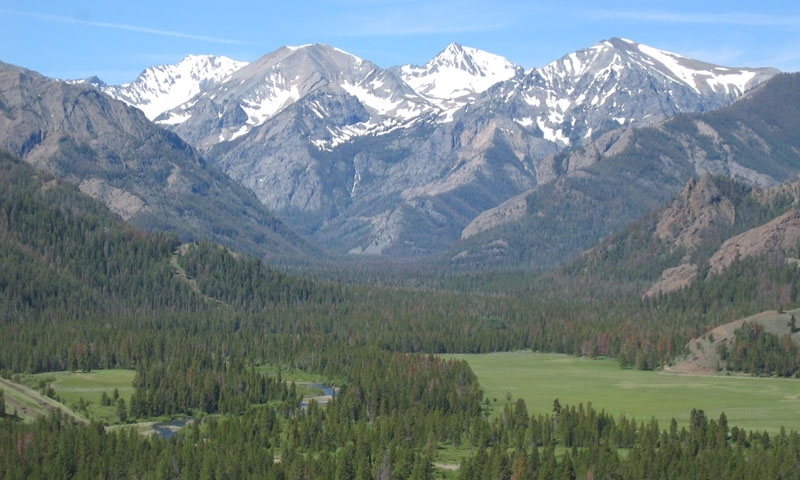 At Crow Creek Pass you’ll get the wonderful vista of Yellowstone Park and Yellowstone Lake. To get to the trailhead, go on US 14/16/20 for 50 miles from Cody, then down a mile on a service road behind Pahaska Teepee. You can also get to this trail via the Crow Creek junction from the Pahaska-Sunlight trail. Take a gentle grade up to get the views of Sleeping Giant Mountain. After 3.5 miles you’ll come to a little mountain meadow and continue on to timberline where the trail ends. Drive from Cody for 46 miles west on US 14/16/20. There is no sign but you’ll see a pullout where two or three cars can park. Pass through meadows and wilderness forest on this 6.5-mile hike. You’ll get some great views of Notch Mountain and Grant Peak from this trail. You have to hike to get to this trailhead. It’s 6 miles up the Pahaska-Sunlight Trail at Red Creek junction. You can reach Pahaska-Sunlight Trail by driving 50 miles west of Cody on US 14/16/20.